The underling to the hugely successful Amprobe PM55A, the cheaper PM51A is still a very good multimeter despite being made for the pocket. This popular little unit is just 3/8″ thick and is less than 3oz in weight, but packs a punch in its feature-set. With more than two-dozen test scales, quick auto ranging capability and a decent screen, it is perfect for nimble troubleshooting jobs over standard, cumbersome meters. Especially good for home maintenance and ham radio enthusiasts. Like the PM55A, the 51A can test most of what you’d want in a meter. Although it can take on 600V in both AC and DC voltages, keep in mind that the PM51A is a small device with an equally diminutive category rating which is not safe for testing mains voltage directly at those energies. Note: The default range is AC volts – the center button switches over to DC. The PM51A cannot measure amperage, although the resistance range is an impressive 400Ω to 40MΩ. In addition is a frequency scale to 1MHz and capacitance up to 3000μF. The continuity checker is okay speed wise and has a loud beeper. Diode testing is a bit short on power to light all color LEDs. The clear display is nice and oversized with big digits and icons, although is not backlit. Auto ranging: This is when the meter selects the correct scale in a given range – such as AC voltage – without having to manually adjust like older style multimeters do. The PM51A does this quite well and you can also manual-range. Usage: Great when on the go, such as for those in service engineering and basic checks for auto and HVAC engineers in tight spaces. For amateurs, it is ideal for knocking around the home checking switches and batteries etc. These accuracy figures aren’t bad for a meter of this size and price. As per the norm, it is best when testing lower voltages, especially under 6V, which makes it good when testing batteries. The PM55A is understandably more accurate and also has non-contact voltage detection and AutoTect, but lesser resistance, frequency and capacitance ranges. The test leads are hardwired to the base and have sharp probes. This is a plus and minus; a positive in that you don’t have to worry about connection issues, but you cannot replace them. There is also nowhere to store the leads and they don’t have protective rubber boots. Display: The 3 3/4 digit screen translates to a resolution to 4000 counts. Screen refresh rate is around three times a second. The best thing about this display is its size to unit ratio, but there is no backlight. Both auto ranging and continuity checks are fairly impressive on time. The Amprobe PM51A also has a screen hold and Max Hold feature. With hold, you can keep any present value on screen, while Max Hold enables you to capture the maximum voltage in a given test period automatically. This is perfect when in tight spots with no spare fingers available. The automatic shut off is a must for a unit of this size, shutting it down after 30 minutes of idling time. Power: Of battery power, you get a lot of mileage from the coin cell as this unit does not draw too much operational current – 2mA. Keep in mind that when battery power is low, erroneous readings are more likely to result. There is low battery indication, however. Despite the relatively high voltage for this small unit, bear in mind that it is only rated to CAT-II at those energies, meaning it shouldn’t be used to test between phases voltage directly. At mains voltage, however – up to 300V – it can test to CAT-III, including at the socket outlet/circuit breaker level. This review of Amprobe’s PM51A revealed a very capable pocket multimeter. Although about as small as it gets, it has impressive speed and okay accuracy, and can test voltage to CAT-III level. Although not backlit and lacking amp scales, it does most else and is a super-handy meter to have as a backup in the top of your toolkit, or indeed as the final device for amateurs. 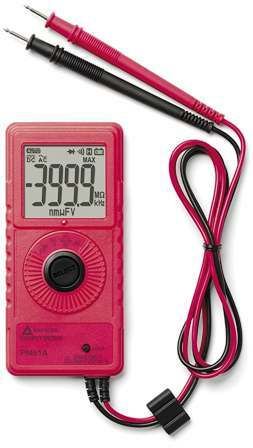 Alternatively: The PM55A does offer current measurements and also contactless voltage detection, but is double the price.